Greetings my friends. Christmas is less than three weeks away! Where did the time go? I will be going to my sister-in-law's for Christmas dinner on the big day. In the meantime, I put together this family-friendly, red, white and natural, Scandinavian-inspired Christmas tablescape for my family of four. We will enjoy a vegan roast and a whole bunch of veggie side dishes here for our own small celebration. I wanted the table to be simple and on the casual side, with some fun DIY additions. I turned to Cricut Design Space™ for some ideas. 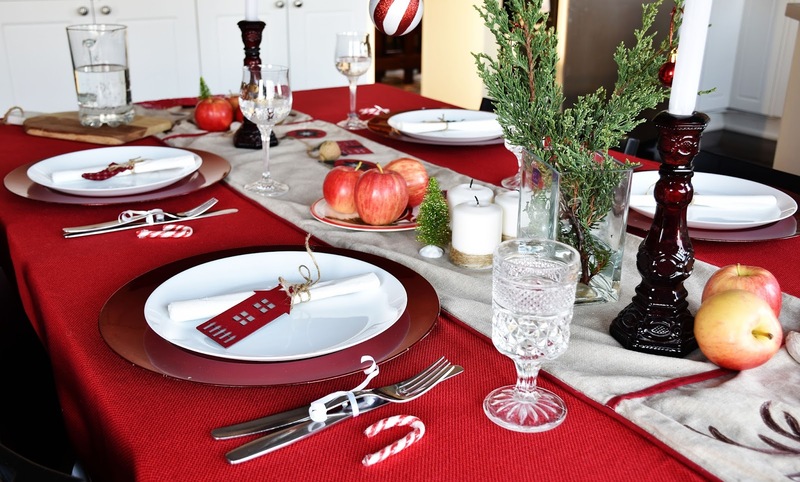 I had decided on a minimal, red and white table, with natural touches, seeing as the kitchen is next to the family room, which I decorated mainly in rustic and red this year. 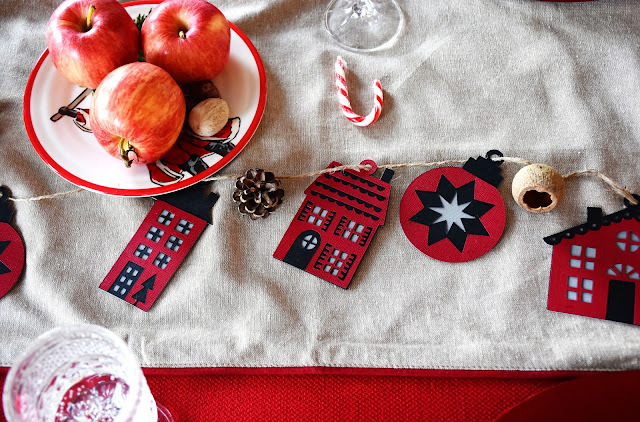 This Christmas Village Garland, inspired by the simplicity and clean lines of Scandinavian design, would be perfect. 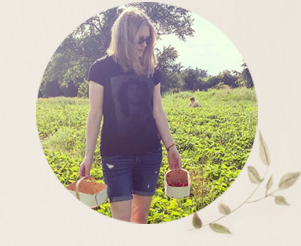 When you're a Cricut Access member, many designs, fonts and images are free of charge in Design Space. 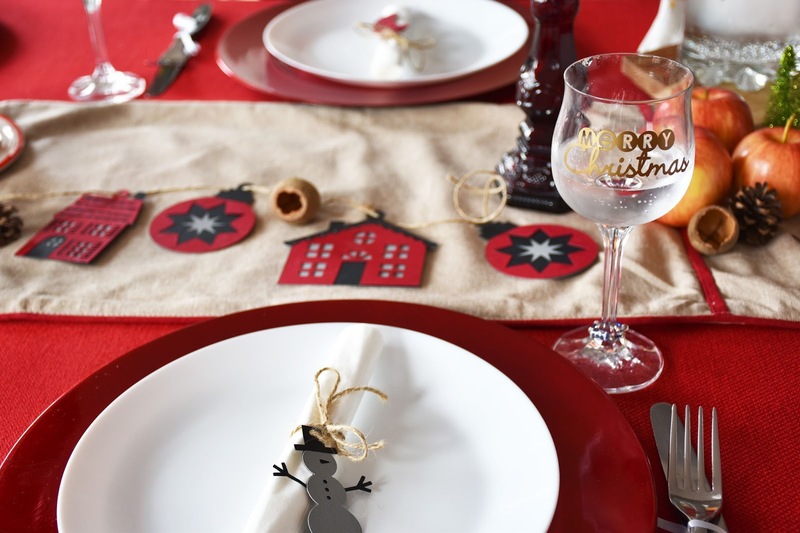 Other exclusive designs, like this Christmas garland, are discounted 10% for Access members. 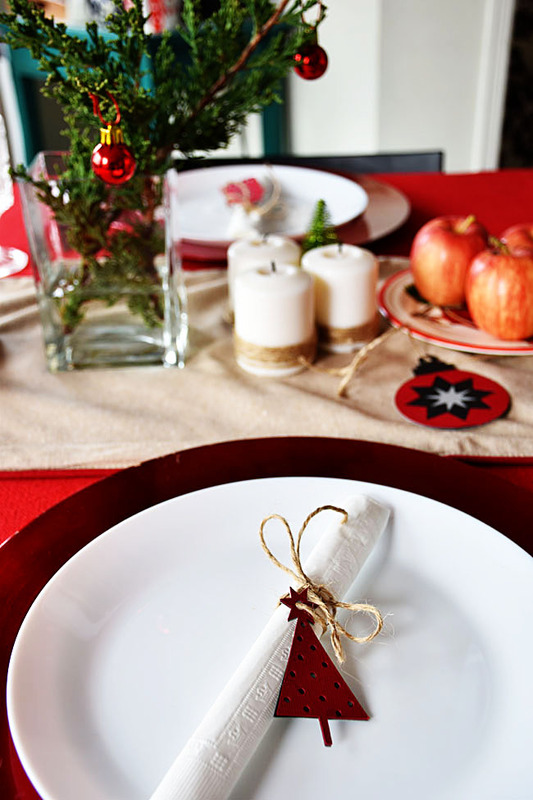 This Scandinavian garland design is $1.99 USD before the discount. And well worth it, because the images can be used for gift tags and ornaments too. I decided to only use part of the garland, so I selected "Customize" and then deleted the elements I didn't want. I also wanted to use some of the skinnier designs as napkin tags, so I re-sized those to be about 3 inches tall. The original design calls for red, white and black glitter cardstock, which would be very pretty too! 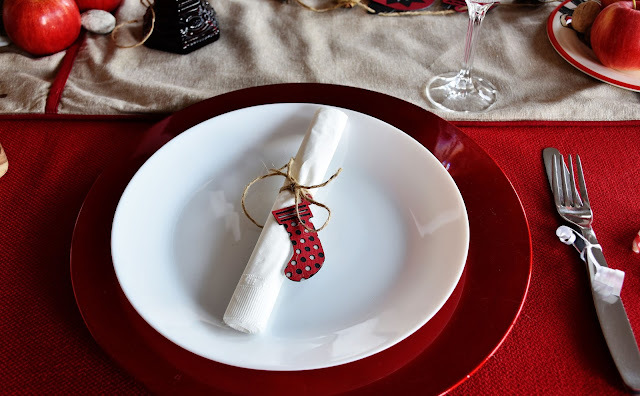 The garland and napkin tags are super simple and quick to make. Just follow the prompts in Design Space to cut from the three cardstocks. Use the weeder to pop out any little "windows" or circles that didn't stick to the mat. Glue the layers of the images together and run the ribbon or twine through the cut holes. 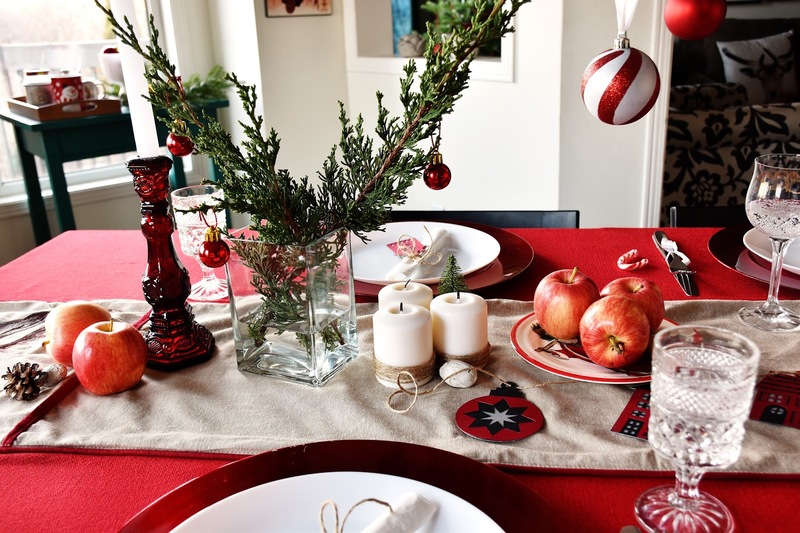 Here is the garland on my holiday table, above. 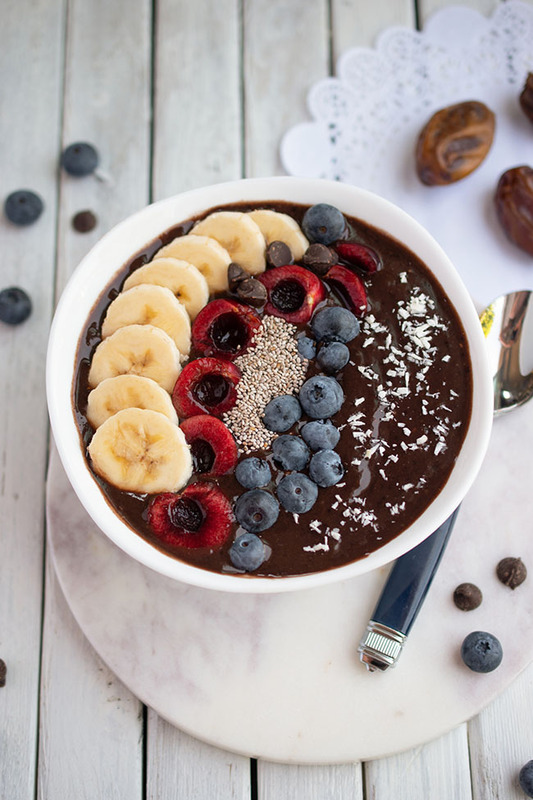 Doesn't it add a dash of cheer? I feel like it speaks to a family table as well - it's kid-friendly and not too serious. 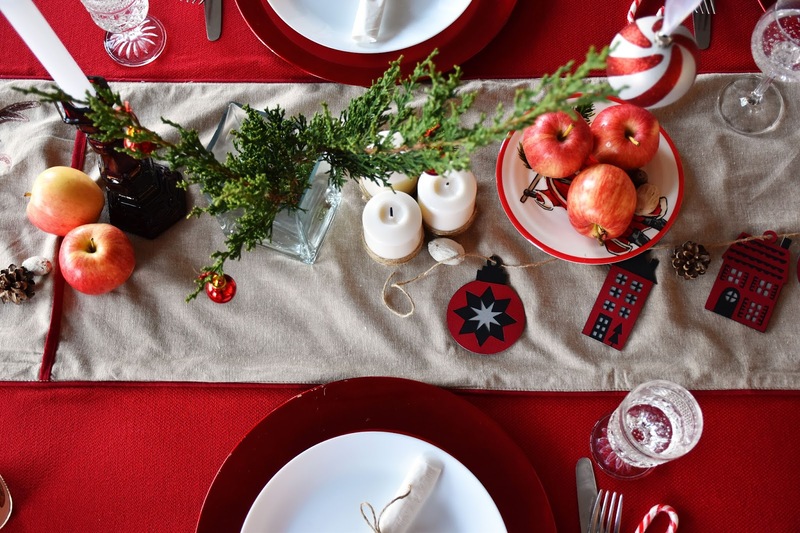 This garland would be great for a kids' table if you're doing two separate tables. Here is the little Christmas tree, used as a napkin tag. And the snowman. I like the grey, but clearly you could do this in red or white too. And the wee black, grey and red Christmas stocking. I love me a bit of gold bling at Christmas too, so I decided to add some gold vinyl wording to the wine glasses on my Christmas table. I also really like these curlicue wine glass decals, a free design for Access members. Before you decide to enter the wording into Design Space on your own, you can also search the available images for the message of your choice. I searched "merry Christmas" and found over 2,000 results, many free for Access members and others with a small cost. I didn't search too far - I liked the fourth image in the top row, above. Once you insert the image into your design, adjust the sizing to suit your glass and you're ready to cut! The great thing is, these decals will take you about 10 or 15 minutes to cut and apply to your wine glasses (or regular glasses). 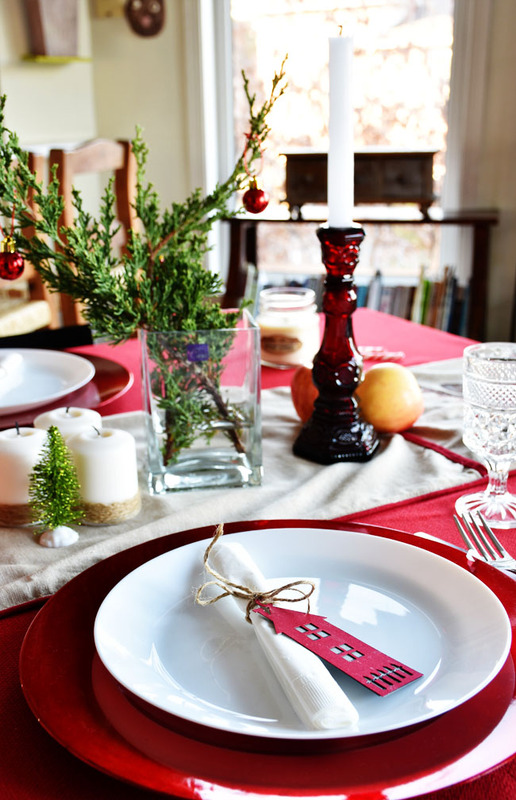 It's such a simple yet festive update for your holiday table. You could also put decals on vases, mason jars and mugs. Go nuts. Because the lettering is fairly small for a wine glass, I recommend using transfer tape to apply the vinyl. 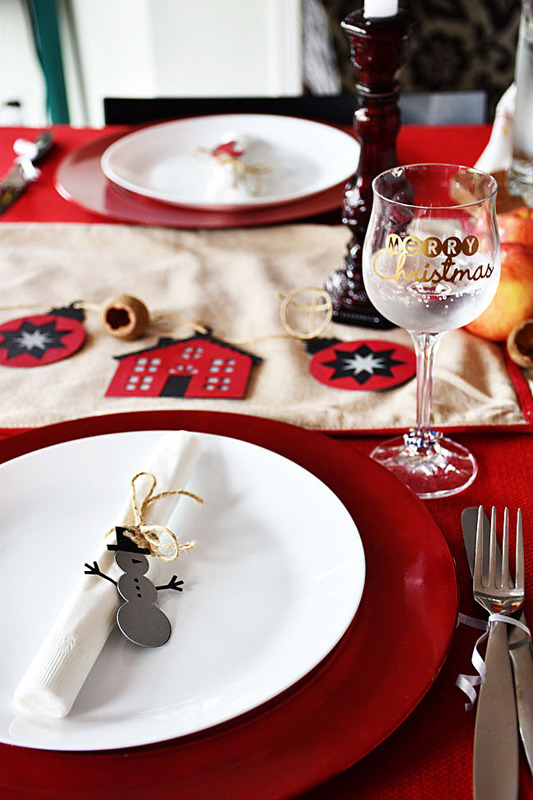 I think the "Merry Christmas" decal adds a festive touch to our wine glasses, don't you? I'm sure the wine doesn't hurt either. In keeping with the casual red, white and natural theme, I added a bunch of red apples and some evergreen clippings in a glass vase. Simple, natural and, in the case of the Juniper branches, free. I plucked the two red vintage Avon candle holders from my mantel for the dinner table. I like the way the light shines through the red glass. 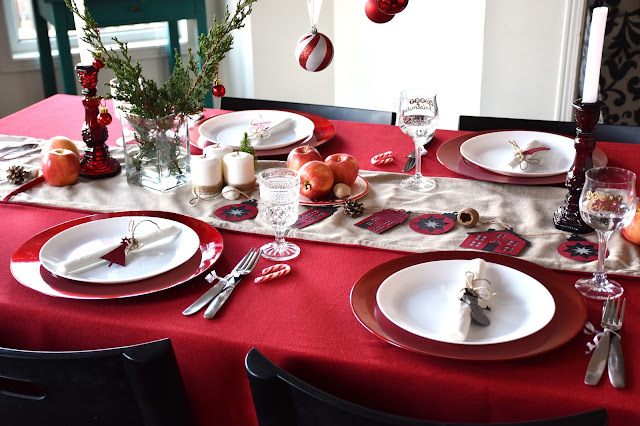 I scattered small pine cones and other natural elements along the table runner and added a couple of inexpensive sparkly green mini Christmas trees. I wrapped twine around the bottom of three ivory coloured candles, gluing the ends with a hot glue gun. I put mini candy canes at each place for "dessert." Oh, and I hung a few red and white ornaments from the chandelier on white ribbon. 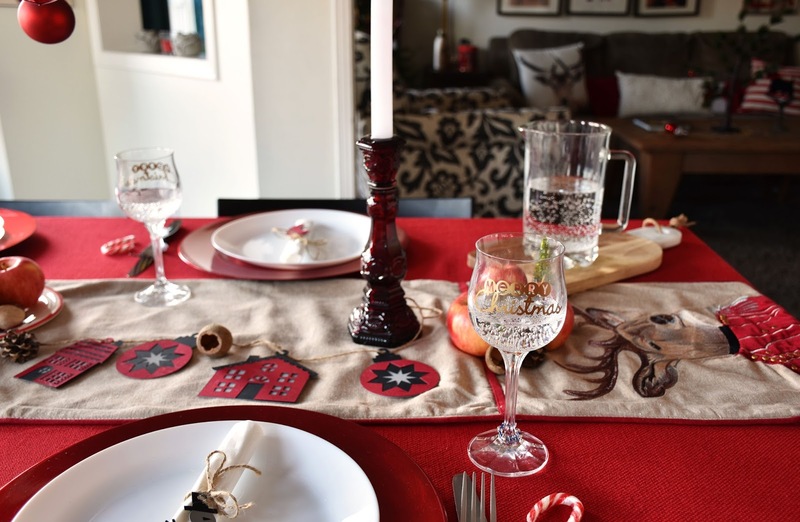 I hope my family-friendly, red and white table with natural touches has given you some ideas for your own holiday tablescape. 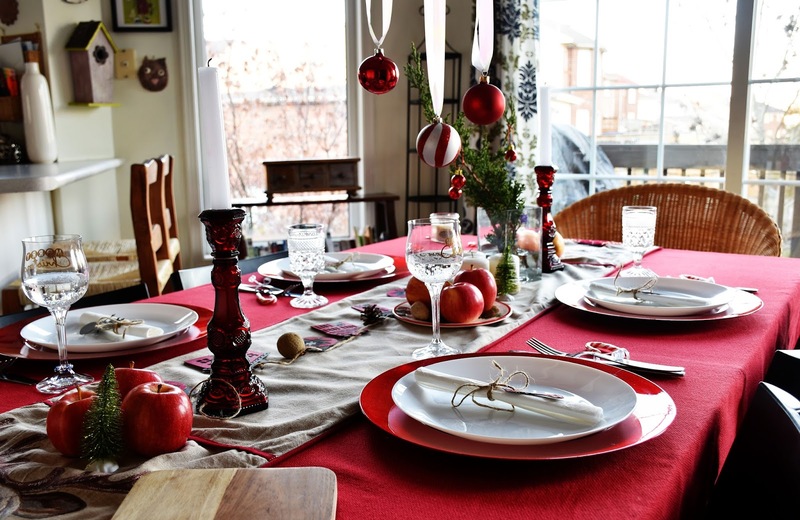 Are you hosting Christmas dinner this year? 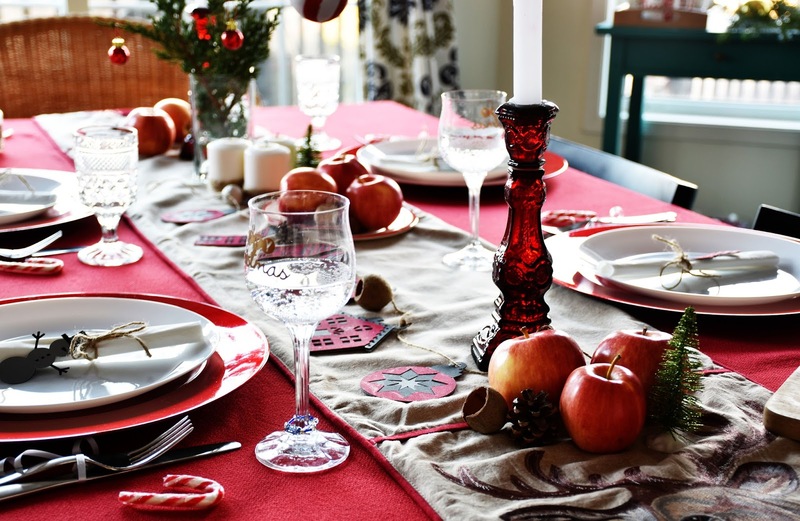 What colour(s) will you decorate your table with? Will you be incorporating DIY elements? 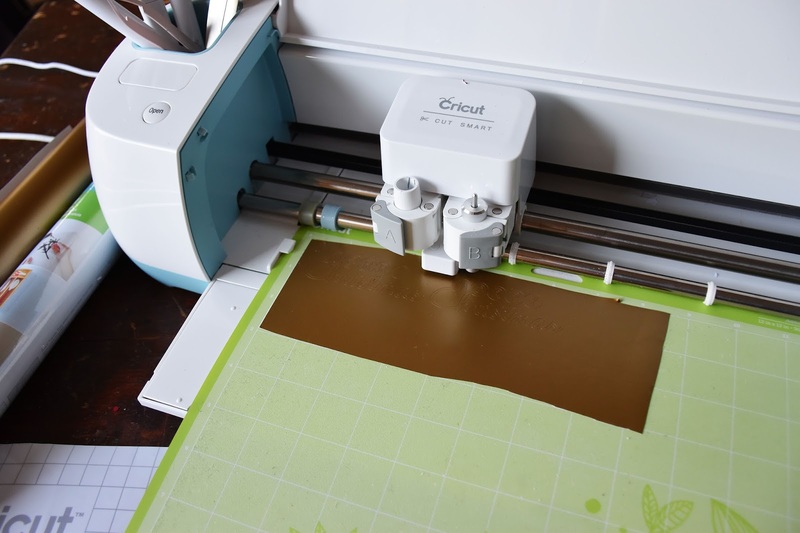 If you do a lot of crafting with your Cricut, you should consider subscribing to Cricut Access. It gives you monthly or yearly access to over 30,000 non-licensed images, 1,000 projects and 370 fonts! There are three different plans: Cricut Access Fonts, Cricut Access Standard and Cricut Access Premium. You can purchase a monthly or yearly plan from the Cricut website, or through Cricut Design Space™. In Design Space, the images, fonts, and projects that are included in Cricut Access are flagged with the Cricut Access symbol. 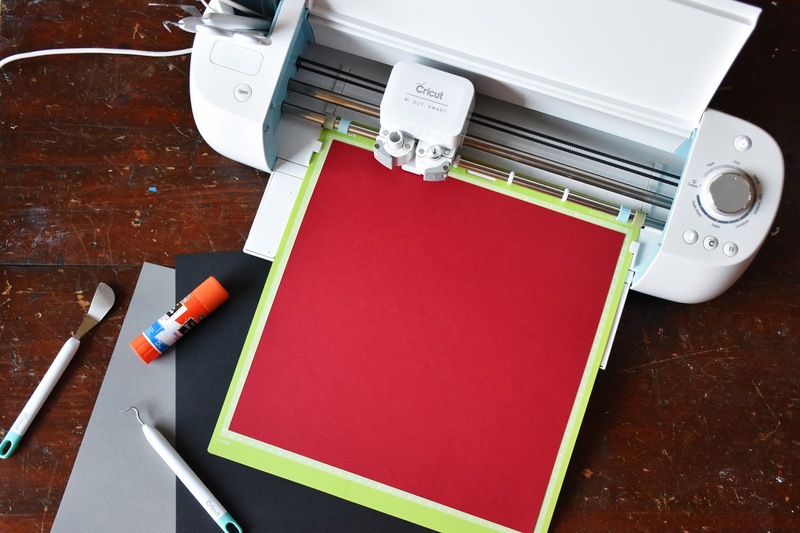 Enter below for a chance to win the new Cricut Maker! 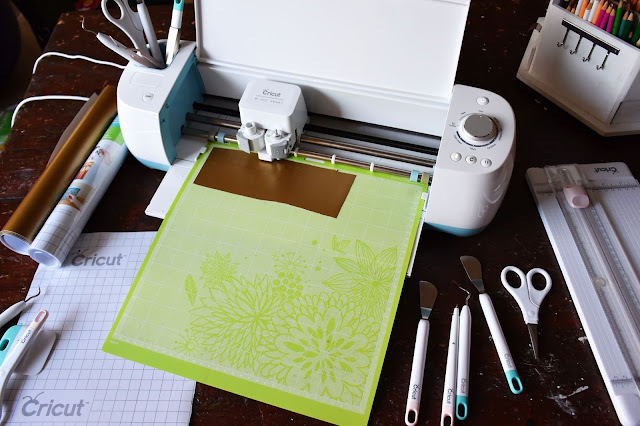 Enter using the rafflecopter for a chance to win the latest addition to Cricut's product lineup - the awesome Cricut Maker! Giveaway is administered by Cricut. Woman in Real Life is not responsible for prize fulfillment.